One of my hobbies this year has been to learn about edible wild plants. The spring season was abundant with porcini mushrooms and fiddlehead ferns but the heat of summer slowed my outdoor foraging adventures to a halt. Most of the edible green plants are only good as tender shoots fresh out of the ground. I lost track of my Edible Wild Plants book (which I highly recommend) until some fresh red berries on the side of the road reminded me that it's berry season. I know the basics about common blackberries (which don't grow much on the east side of the state) and huckleberries, but I have been eager to learn about some of the lesser known varieties. Last weekend our family had a chance to get away to Mount Spokane and explore. We did find an abundance of huckleberries but I'll offer a report here on what we learned about some of the other less-prized sweet little morsels of wild goodness. Thimbleberries: These are readily availbale along roadsides. They are in the raspberry family of plants, but are more tender and drier than some of the sweeter berries. I've heard they are considered a delicacy in the midwest where they are made into jam. My rule of the thumb is that if you take four cups of any berry and combine them with 8 cups of sugar for jam they will taste awesome and aparently that rule holds up with the thimbleberry. Thimbleberry fruits are larger, flatter, and softer than raspberries, and have many small seeds. Because the fruit is so soft, it does not pack or ship well, so thimbleberries are rarely cultivated commercially. However, wild thimbleberries make an excellent jam which is sold as a local delicacy in some parts of their range, notably in the Keweenaw Peninsula of Upper Michigan. Mountain Ash Berries: I noticed that these are abundant at Mt. Spokane and you don't have to look too hard in any landscaped area to find these berry-laden deciduous trees. I had no idea they are edible until I found them listed in my book. There edibility comes with a caveat – don't eat them raw and they are best when harvested after the first frost. Here's some more info. The fruit of European Rowan (Sorbus aucuparia) can be made into a slightly bitter jelly which in Britain is traditionally eaten as an accompaniment to game, and into jams and other preserves, on their own, or with other fruit. The fruit can also be a substitute for coffee beans, and have many uses in alcoholic beverages: to flavour liqueurs and cordials, to produce country wine, and to flavour ale. In Austria a clear rowan schnapps is distilled which is called by its German name Vogelbeer. Rowan cultivars with superior fruit for human food use are available but not common; mostly the fruits are gathered from wild trees growing on public lands. Rowan fruit contains sorbic acid, an acid that takes its name from the Latin name of the genus Sorbus. 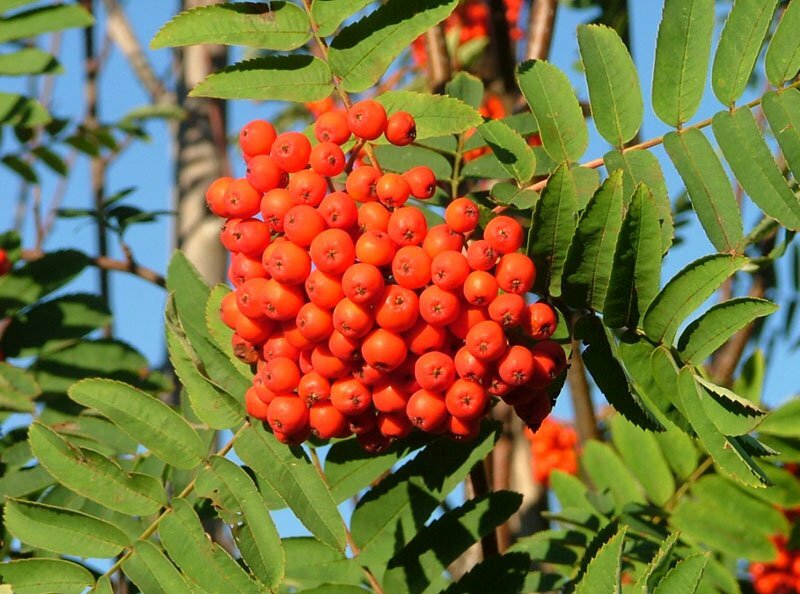 The raw fruit also contain parasorbic acid (about 0.4%-0.7% in the European rowan), which causes indigestion and can lead to kidney damage, but heat treatment (cooking, heat-drying etc.) and, to a lesser extent, freezing, neutralises it, by changing it to the benign sorbic acid. Luckily, they are also usually too astringent to be palatable when raw. Collecting them after first frost (or putting in the freezer) cuts down on the bitter taste as well. Elderberries: There are two varieties of elder berries that I've seen, one that has a shiny dark purple fruit, almost black, with a purple stem, and another that is a dusky light blue color with smaller berries. Here's the scoop on the shiny dark purple variety known as sambucis-nigra (pictured to the right). The dark blue/purple berries can be eaten when fully ripe but are mildly poisonous in their unripe state. All green parts of the plant are poisonous, containingcyanogenic glycosides (Vedel & Lange 1960). The berries are edible after cooking and can be used to make jam, jelly, chutney and Pontack sauce. Also when cooked they go well with blackberries and with apples in pies. Here's the link to the USDA citation. Here's another helpful link. 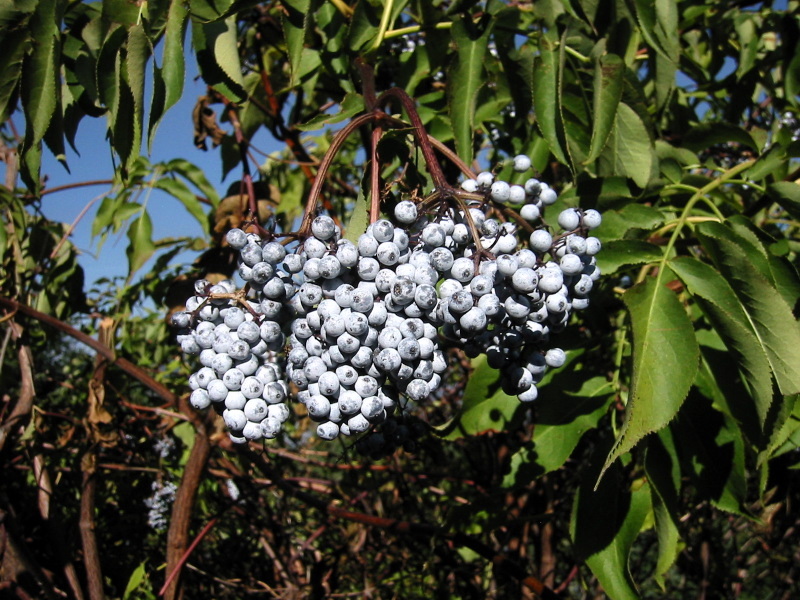 Edible Uses:The fruits of blue elderberry are edible raw, cooked or used in preserves. This is the most well-tasting of the North American elders, even though it is full of small seeds. The berries are rather sweet and juicy. They can however cause nausea if eaten raw, but ripe berries are edible when cooked. Berries can be used in portlike wine, jams, and pies. They should always be cooked and are used primarily in wines and syrups. The fruit is usually dried before being used. Some caution is advised, see the notes below on toxicity. The flowers are edible raw or cooked, and are said to be pleasant and refreshing raw. A pleasant tea can be made from the dried flowers. Caution:The leaves, green fruits and stems of members of this genus are poisonous. The stems, bark, leaves and roots contain cyanide-producing glycosides, and are therefore poisonous, especially when fresh. The fruit of this species has been known to cause stomach upsets. Any toxin the fruit might contain is considered to be of low toxicity and is destroyed when the fruit is cooked. As you can see, even with edible berries, there are cautions that need to be taken. Only eat wild berries and plants that you have identified with the help of a proven guide book. My post here is not enough to effectively ID these berries, and it is not offered as a guide. This is just a report from the field and a friendly invite to explore the often hidden wonder and beauty of what the land offers up. I'll continue to explore and report on what I find. Let me know if you have a lesser-known berry that is a favorite.